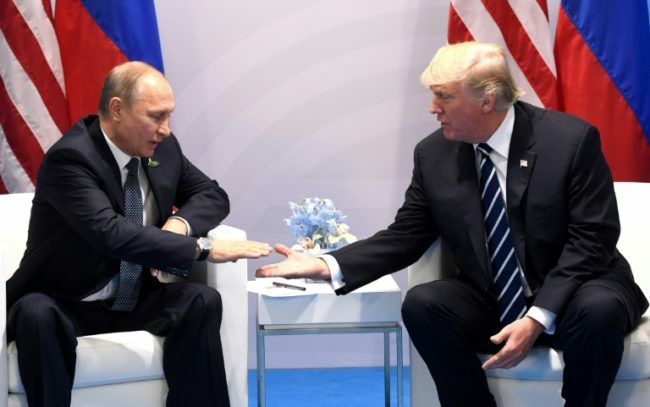 Putin, Trump had secret second meeting at G20 – Royal Times of Nigeria. US President Donald Trump and Russian President Vladimir Putin had a second, undisclosed meeting during the G20 summit in Hamburg, news reports said Tuesday. The second meeting lasted about one hour and took place after the more than two-hour meeting that had previously been disclosed and widely described in news reports, according to the Washington Post and other US news media. Trump appeared to confirm the meeting in two tweets, but insisted the story was “fake news” and that the media had already been aware of it. “Fake News story of secret dinner with Putin is ‘sick.’ All G 20 leaders, and spouses, were invited by the Chancellor of Germany. Press knew!” he tweeted. US intelligence agencies have accused Russia of interfering in last year’s presidential election, and there are investigations into whether there was any collusion between Moscow and the Trump campaign. The second meeting between Trump and Putin during the summit took place at a couples-only dinner for G20 leaders on July 7, a senior administration official said, according to the news reports. Trump initiated the meeting by leaving his seat in the Hamburg Philharmonic to sit next to Putin. The only other person present was Putin’s official interpreter. There was no information on what they discussed. Trump’s longer official bilateral meeting with Putin was the first face-to-face meeting between the two presidents. The US president has said he wants to improve US-Russian relations so that they can work together on global problems like the war in Syria. In another Russia-related announcement late Tuesday, the White House said Trump intended to nominate veteran diplomat and businessman Jon Huntsman as US ambassador to Russia. If Huntsman, the former Republican governor of Utah, is confirmed by the Senate to the diplomatic post it would be his third ambassadorship. Huntsman previously served as US ambassador to China and to Singapore. Huntsman is chairman of the foreign policy research institute Atlantic Council and heads a cancer foundation. He also sits on the boards of directors of major companies such as Hilton, Chevron and Ford. He and his wife Mary Kaye have seven children.